Advances in technology and the spread of the internet has made it easier than ever for animators to get their stuff out there. This also means it's easier than ever for the good stuff to get lost in the crowd. How do you know what's worth watching? That's where we come in! Welcome back to a little thing we like to call... Web Animation Watch. 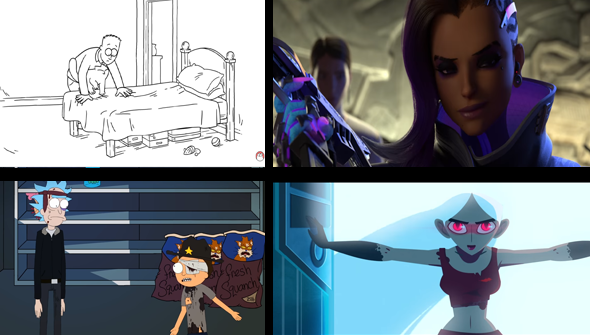 Whenever we think that the people at Blizzard have stopped surprising us with more animated shorts tied to their hit videogame Overwatch... they go and do it again. The game recently added a new playable character named Sombra, and to mark the occasion we get another short named Infiltration. The new one is up to the very high standards set by the previous entries, with high production values and fantastic action. Can Blizzard just set up a movie division now, please? Blizzard also released this 2D animated origin story for the character. We can never get enough of Simon's Cat. Funny, adorable and brilliantly observed, it hits it out of the park every time. Some episodes can be more true-to-life than others, which sometimes use more exaggeration for comic effect. The latest short Bed sheets is firmly rooted in reality though- as anybody who has ever tried to change the sheets with a mischievous cat around can attest! Mashed presents this pretty accurate mash-up of Rick and Morty and The Walking Dead. The inspiration here though isn't the hit zombie TV show or the original comic, but rather the (excellent) videogame series from the folks at Telltale Games. Even if you aren't familiar with the games though, you'll be impressed by how well Rick and Morty are brought into this very different world. Contains strong language and adult humour. Ouro is a short film with a visually arresting 2D style, with 3D touches. This is a short action piece with an appealing central character, all set to an impressive electronica soundtrack. We imagine that if Cartoon Saloon made action movies, they would look something like this. From directors Pierre-Jean Le Moël and Eva Jiahui Gao. Made something that could feature in a future WAW? Drop us an email.